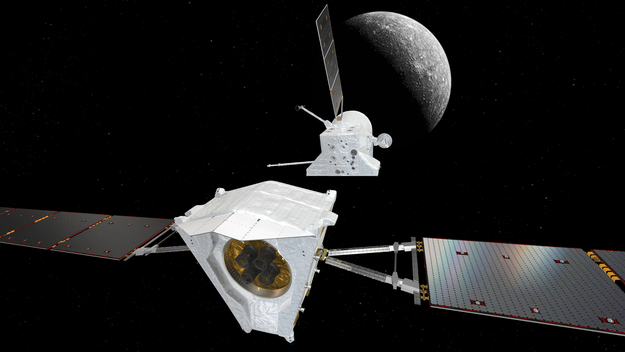 Artist's impression showing the Mercury Transfer Module separate from the BepiColombo Mercury Planetary Orbiter (MPO) and Mercury Magnetospheric Orbiter (MMO) composite spacecraft. The transfer module is only needed for the journey to Mercury. The two science orbiters will be captured into Mercury orbit, and the small thrusters on MPO will be used to deliver MMO into its orbit. There, MMO will be ejected from MPO and spun up. MPO will then discard the sunshield, and continue into its own orbit around Mercury. The view of Mercury is based on imagery from NASA's Mariner 10 mission.